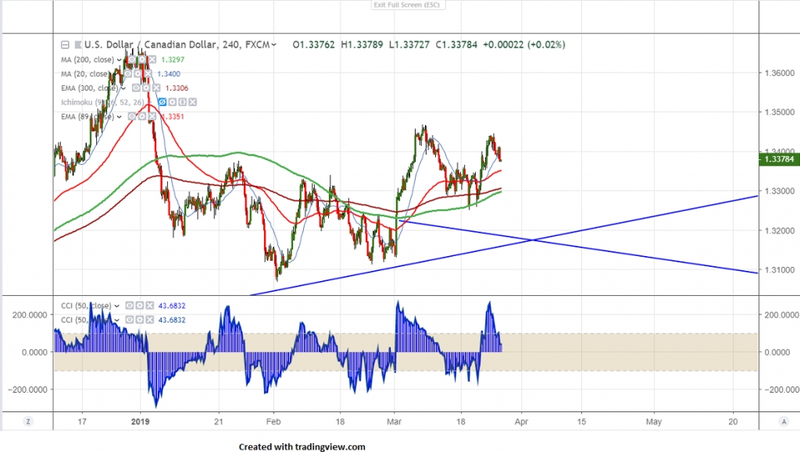 USDCAD has halted its 5 days of uptrend yesterday and lost more than 70 pips from the minor top around 1.3444 on account of rising oil price. Loonie hits intraday low of 1.33720 and is currently trading around 1.33750. From previous week the pair was trading higher and jumped more than 180 pips on declining US 10 year bond yield and it hits low of 2.37% lowest level since Dec 2017. WTI crude is trading higher and hits fresh 4-month high on oil supply cut and expectations of a further drop in US inventories. But weakness in global growth outlook is to cap further upside in oil price. It hits high of $60.35 and is currently trading around $59.92. On the higher side major resistance is around 1.34674 high made on Mar 7th and any convincing break above will take the pair to next level till 1.3500/1.3600. It should break above 1.3660 for bullish continuation. The near term support is around 1.33250 and any violation below will drag the pair to next level till 1.3195/1.3120.Any violation below 1.30680 confirms further weakness. It is good to buy on dips around 1.3350 with SL around 1.3300 for the TP of 1.3465.